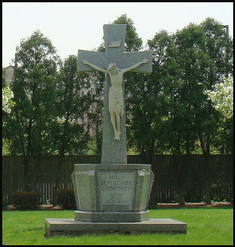 The River Valley Memorial Gardens and the Holy Sepulchre Catholic Cemetery are located in West Dundee, Illinois. Both were established in 1961 by the late Joseph F. Estes, president of Haeger Industries, Inc. The groundbreaking took place on March 12th of that year; both cemeteries will be celebrating their 51st anniversary in 2012. Bishop Loras Lane of the Rockford Diocese consecrated the Holy Sepulchre Cemetery grounds. The Holy Sepulchre Cemetery is one of only two Rockford Diocese Cemeteries in the Elgin Deanery and has provided caring service to the Catholic families in the area for almost 50 years. The staff of River Valley Memorial Gardens and Holy Sepulchre are dedicated to providing care and counseling to families for their At-Need and Pre-Need services. We can help you make arrangements for grave spaces and interments, cremation spaces, vaults and bronze memorials.